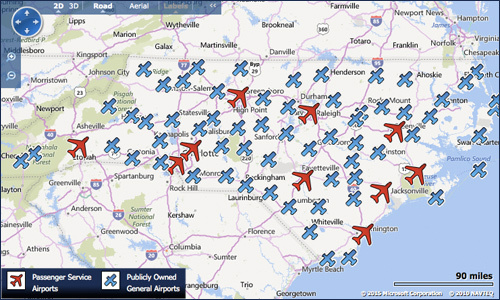 North Carolina is home to dozens of airports. 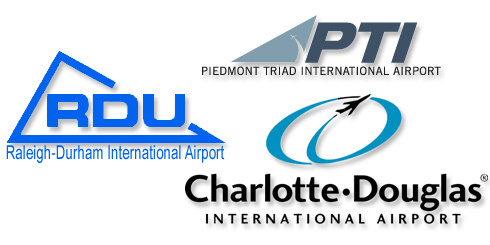 With Triad Connection, travel to and from RDU, CLT, PTI/CSO and other area airports has never been easier. We provide safe and reliable door to door corporate & airport shuttle transportation as well as airport taxi service throughout the Durham, Chapel Hill, Raleigh, Cary, Greensboro, Winston Salem, Greenville, Wake Forest, Cary, Morrisville and Roxboro areas, and throughout most of North Carolina. Bottom line... You've got enough on your mind. Let us get you to the airport safe & on-time Unlike most airport shuttle services, you don't share (commonly referred to as rideshare) your Triad Connection ride with anyone else. Therefore, we will do everything in our power to ensure your trip to and from the airport is "smooth sailing." If that means stopping at Dunkin Donuts or Starbucks for a Cappuccino or Latte on the way, that's what we'll do. "I am the type of person who stresses about making it to the airport in time, especially when I have to leave before 5am to make a 6:25 am departure. I have been stung before by an airport taxi service, with whom I had scheduled the night before, that didn't show up on time and showed up late only after I called and begged them to do anything they could to pick me up in time for my flight. Frederick understands that even though yours is only one of many fares a taxi has in a day, that to you it can be extremely important. I was glad that I could talk and schedule with the person who picked me up, that I could confirm with him that he knew where my address was. He showed up early, was courteous, and allowed me to start a long travel day stress free." ~ Randy E.
Read more reviews on Google+ by clicking here. Traveling to North Carolina and need a hotel? No worries. You need it, it's here... You name it, you can find it here in the Raleigh/Durham area as well as Greensboro, Winston-Salem, Charlotte, and just about anywhere in between. Already have hotel reservations? Short of bringing the room directly to you, Triad Connection will do everything possible to pick you up and deliver you safe and sound to area hotels. Hotel transfers and hotel transportation are frequently offered by many hotels. However, who wants to share a ride with 2, 3 or even 10 other tourists? You just got off an airplane where, unless you purchased two tickets for yourself, you likely didn't experience anyone's idea of "spacious conditions." With Triad Connection, your ride to the hotel (or ride to the airport) will not be shared with anyone other than the driver. Forget your favorite tie? Or need an extra pair of socks? Unfortunately, these items are not carried in our vehicles, but we'll happily stop at a local shopping destination so that you can feel comfortable and confident in your complete outfits. Within the areas of Raleigh/Durham International Airport (RDU Airport), here's a breakdown... Click on a category to view hotels. Five Stars / 1 hotel; Four Stars / 6 hotels; Three Stars / 77 hotels; Cheap / 137 hotels; Luxury / 7 hotels; Pools / 143 hotels. Within the areas of Greensboro, Winston-Salem and Triad (near PTI Airport), here's a breakdown... Click on a category to view hotels. Four Stars / 3 hotels; Three Stars / 24 hotels; Cheap / 79 hotels; Luxury / 3 hotels; Pools / 73 hotels; Spas / 1 hotels. Within the areas of Charlotte (near CLT Airport), here's a breakdown... Click on a category to view hotels. Five Stars / 1 hotel; Four Stars / 6 hotels; Three Stars / 81 hotels; Cheap / 184 hotels; Luxury / 7 hotels; Pools / 199 hotels.
" Triad Connection is the only transport I use. I travel to RDU Airport from Greensboro every other week and I've come to find Frederick is the only consistent and reliable transportation option out there. If you're traveling in the Triad area this is the only transportation company to use." ~ Michael K.